The Athabasca region is only a 90 minute ride from the city of Edmonton. The area offers rolling hills, scenic vistas, and low traffic paved highways along with enough gas stations and restaurants to keep bike and rider fuelled. Plan a day trip around one of our summer events, or meet up with the Hawg Flatts Motorcycle Association. This summer is the perfect time to check out one of our top rides or discover the north on your own! From Highway 2, take Highway 661 East at Rochester and enjoy a pit stop at the Rochester General Store. Continue East through Newbrook, then turn North onto Highway 831. In the village of Boyle, turn West onto Highway 663. Turn North onto 827, then head west on Highway 55 until you reach the town of Athabasca. Follow Highway 2 home. Follow Highway 2 West through the town of Athabasca towards Slave Lake. Fuel up at the Island Lake General Store and restaurant. Head South on Highway 44 and enjoy a scenic trip by Flatbush, Fawcett, and Dapp. Head East on Highway 661 to reconnect with Highway 2, or continue on Highway 44 to the Yellowhead Highway. 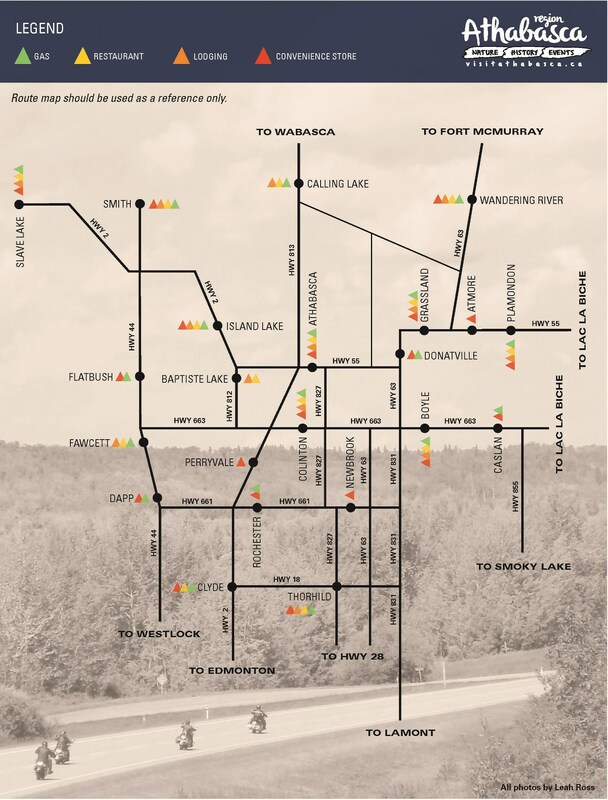 Follow Highway 2 to the town of Athabasca, then follow the signs to Highway 813 towards Calling Lake. Once in Wabasca, turn left onto Highway 734 to Slave Lake, then take Highway 2 back to Edmonton. A full but scenic day! Ride North on paved roads!